One of Mr. OTN’s flaws, or maybe it’s more of a quirk, is his strange affinity for ugly old trunks. We can go into any antique store, even those filled with exquisite treasures, and his eye will be drawn to the ugly trunk in the corner. What is that? Gleaming crystal decanters, shining silver trays, elegant chandeliers dripping with bling, and he goes for the old trunk. This is the latest trunk he fell for, and I’ll admit it was in pretty decent shape compared to some he’s collected in the past. Such good shape, in fact, that I agreed that we could buy it for our den. It would be great. After a little makeover of course. 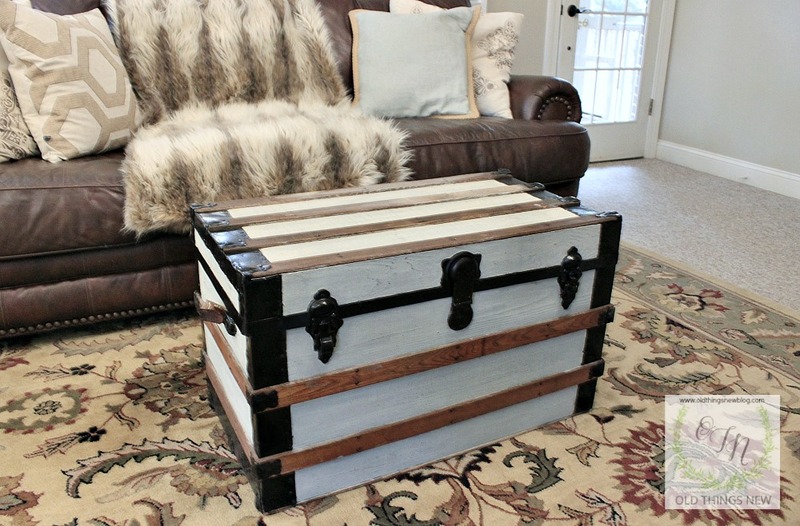 I had in mind the idea of painting it all one color (leather, wood, and metal), a nice creamy ivory. I had the perfect inspiration piece I’d pinned to Pinterest. But, as with most furniture pieces I paint, it told me what color it should be. I started with a layer of a random gray paint, a sample I had in my garage, over which I did a color wash of white. 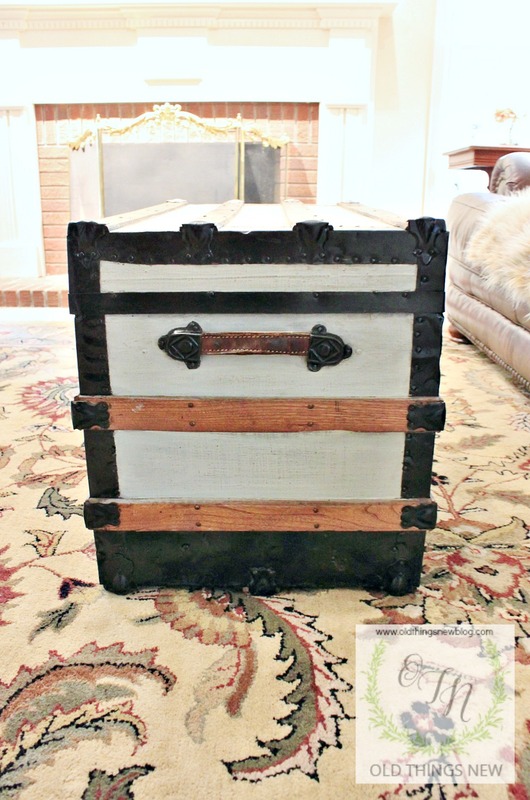 At that point I couldn’t quite bring myself to paint over the rich colored wood or the metal hardware, because the trunk simply wouldn’t let me. 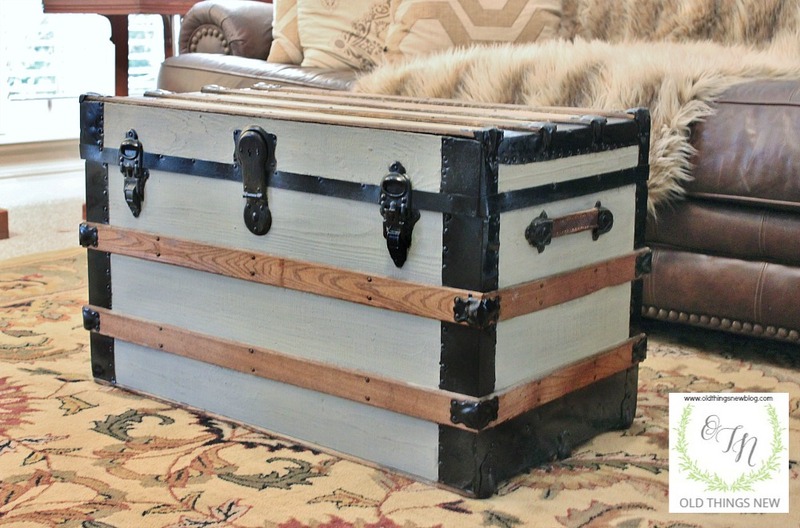 Sheesh, was I getting as caught up in this old trunk as the hubs? That’s when I really began looking at her and saw that the two colors I’d used on her had a slight blue tinge, and the wooden strips a nice warm hue, and the black metal? Well, it was kind of rusty but I could see how it could be freshened up. 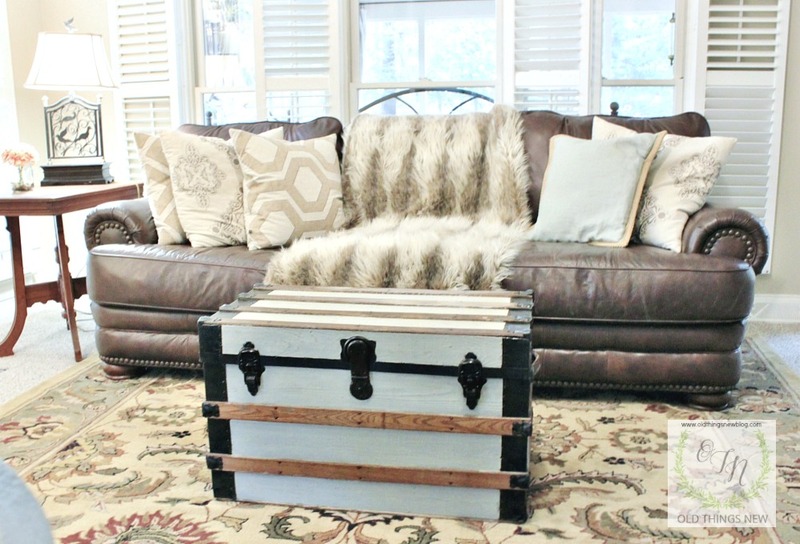 Mr. OTN won, the trunk won, and in the end I won, because after adding a little more stain to the wood and painting over the metal hardware with black Rustoleum, I brought her inside. And the look of her made me happy. Now, since I told you about Mr. OTN’s flaw, it’s only fair that I share with you a flaw of my own. That flaw would be – questioning his wisdom (from time to time) and having a hard time admitting that he was right in the first place. Stubborn indeed. The moral of this story is: Choose to take a second look at your (flawed) loved ones ideas and you’ll be the winner every time! 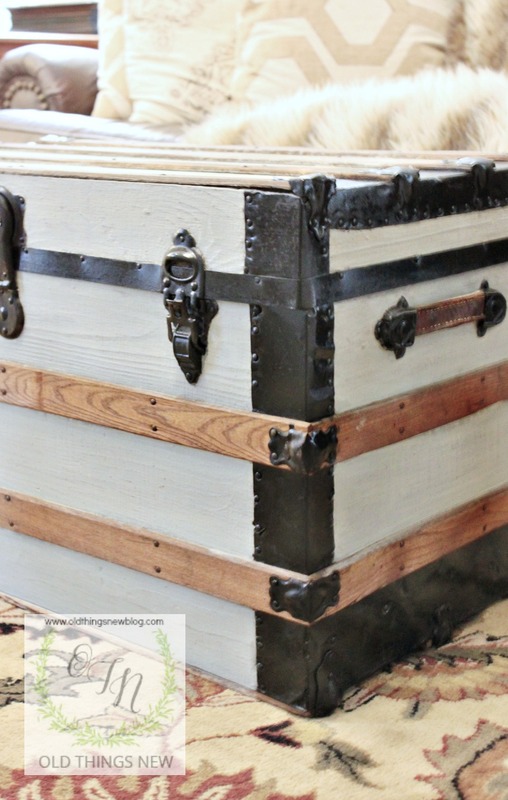 Old trunks have a air of mystery and I always wonder what they’ve contained. 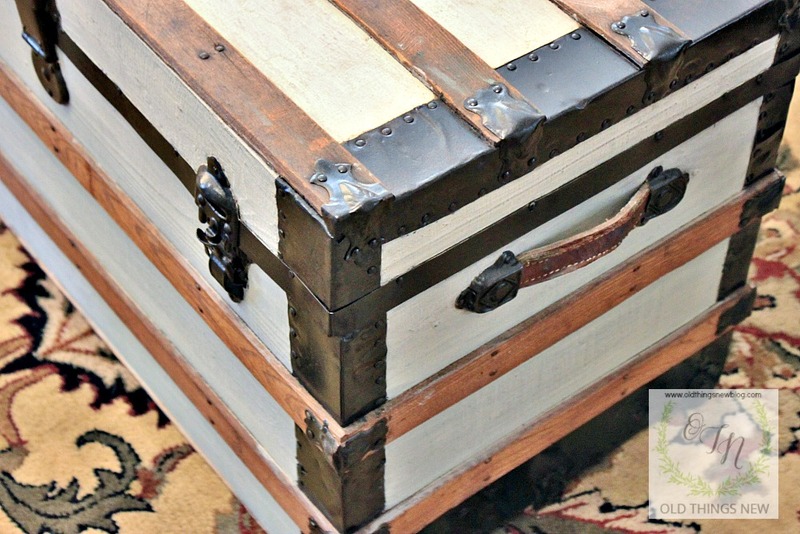 I was blessed with my grandparents trunk that carried their worldly goods from Italy to the US almost 100 yrs ago. 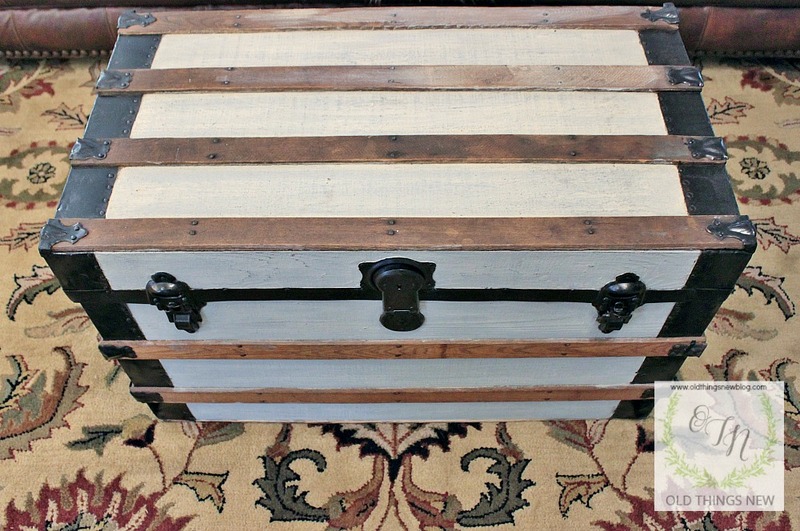 Your refinishing job is perfect and it makes a great coffee table. Good choice I’d say. Love it! I was just talking about having an attitude of gratitude about my hubby last night. We just don’t have to look or listen to hard to find a great man in there. Love your trunk by the way! We really don’t have to look too hard do we? SO blessed!!! I, too, love old trunks. I have to admit, I liked the before better! 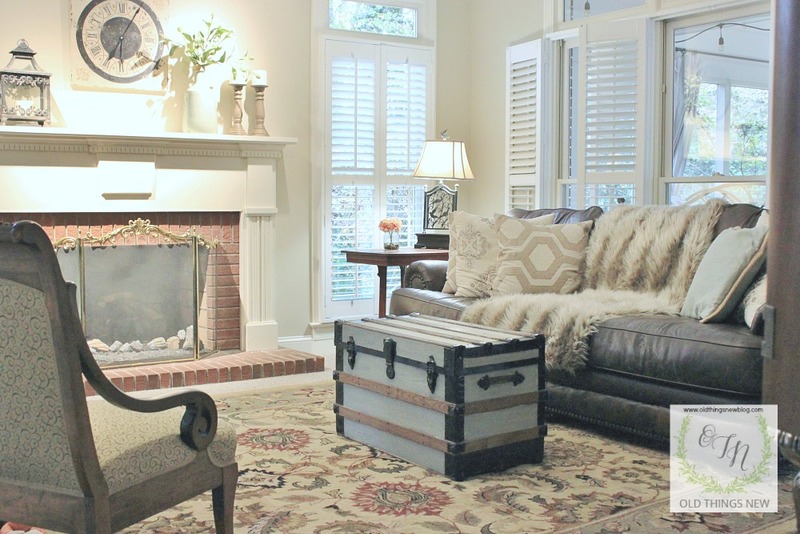 I just mix that look right in with my more glam pieces and it all seems to work, but I do like natural wood and somewhat darker, muddier colors than are in right now. That makes perfect sense if you prefer the darker colors Teddee. I recently read an article that said the dark colors are making their way back in again as many people are getting tired of the all white palette. I think I’ve stayed in the middle somewhere. I’ve never been an all white person (except the kitchen) and I’ve never been one for super dark colors. Maybe I’m just trying to play it safe! It looks wonderful. 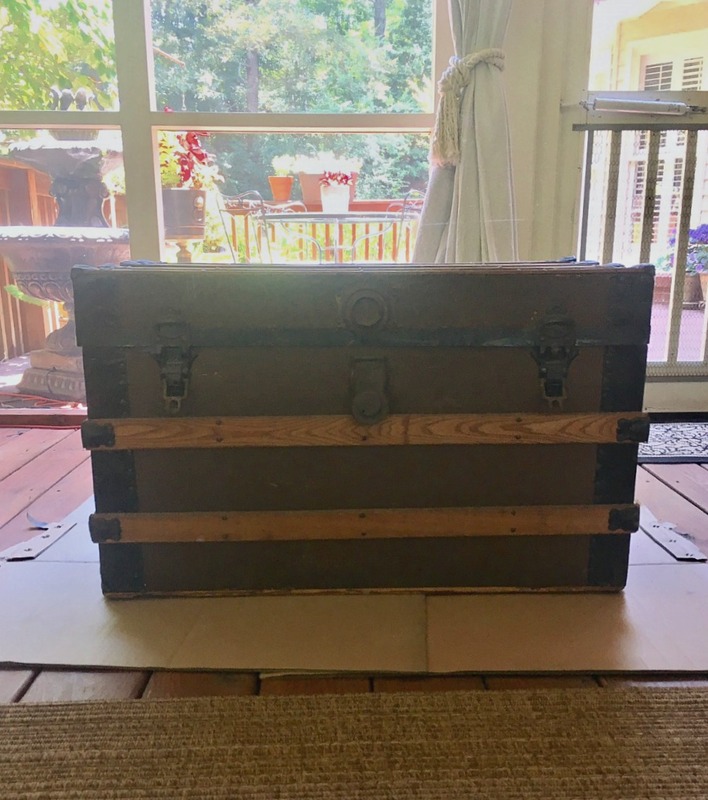 I have my fathers old trunk, or foot locker as he called it from WWII and i do wonder at times what it has been thru.Thanks for this cute post. If only these old trunks could talk. We have one with stickers on it that are peeling off and unreadable. I don’t have the heart to remove them and paint over it because of the character they add. Thank you for the compliment Marlene. My husband says marriage is God’s “school for character!” We each have spent a lot of time in the corner over the years. THAT’s funny and oh, SO true! Loved the “being transformed from glory to glory”! 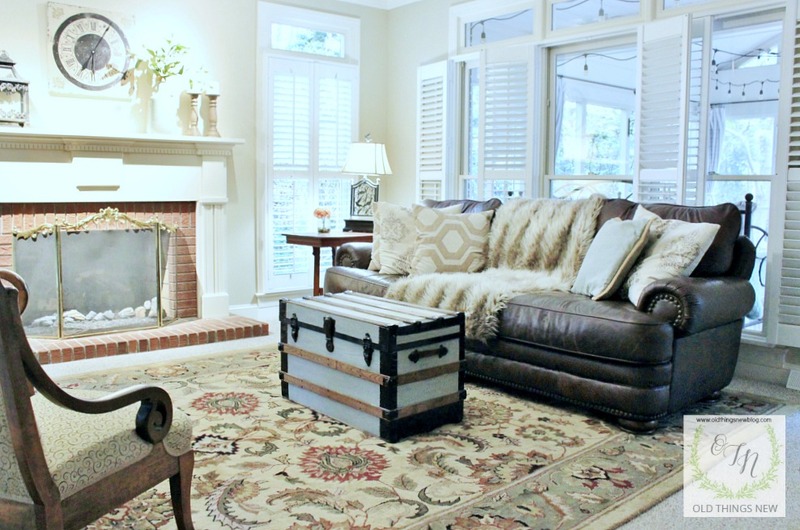 And really, that’s what you do with your pieces that you tweak….don’t you think? 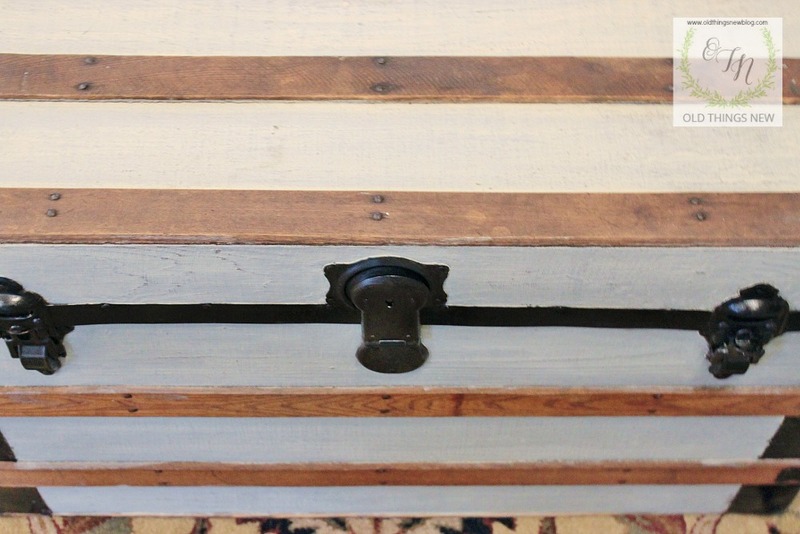 You and Mr OTN have that nice patina that comes from being lovingly worn, like so many of your transformed pieces! 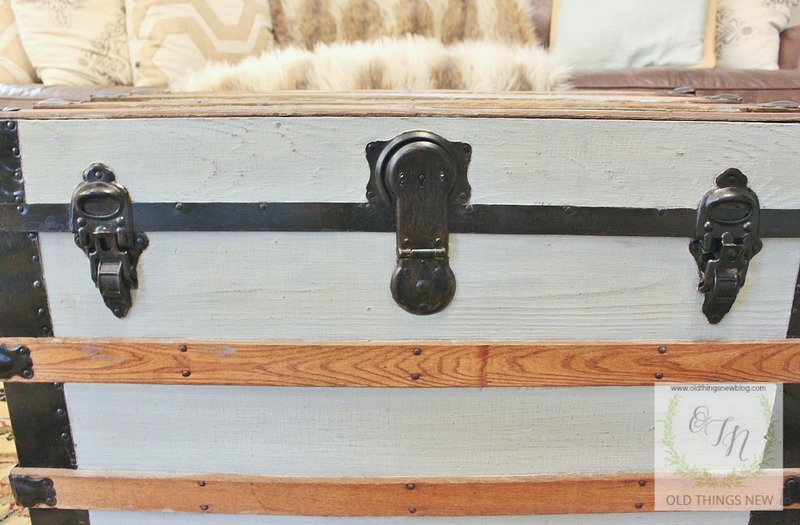 Those old trunks always have a story to tell, if we but listen. It’s so funny, but as I read your comment I was reminded of my post and how I almost inserted that I wondered if old trunks remind Mr. OTN of me! There could be a lot of correlations there doncha’ think? Love you girlfriend. 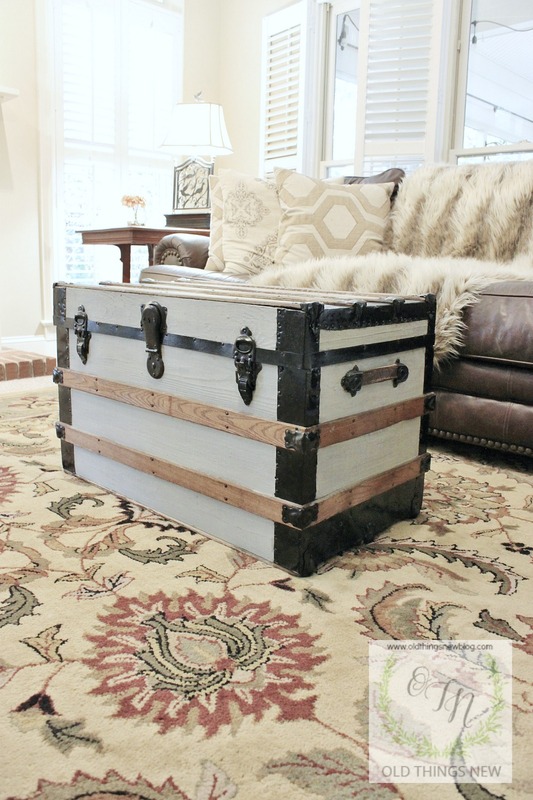 I love the trunk and the lesson. This is a real beauty and you did a great job transforming it. Your mister could see the potential in this one a mile away. I’m like that too. I never met a trunk that I could resist! Haha!! Haha! 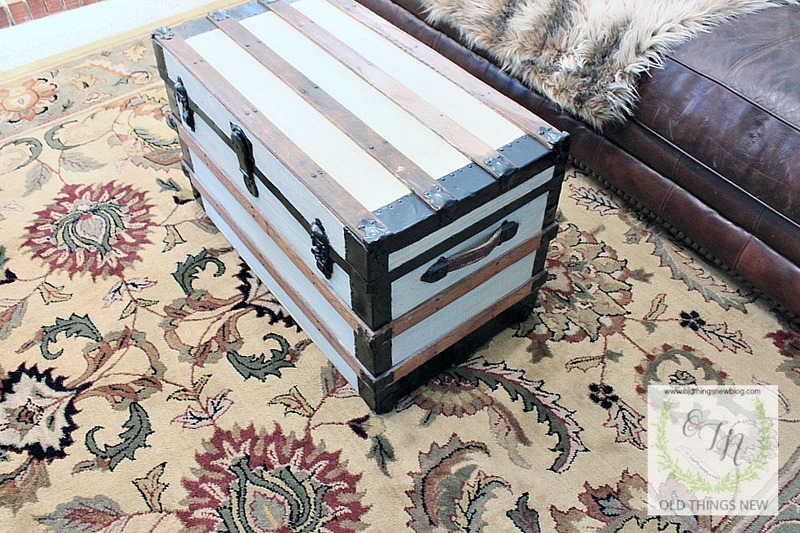 Trunks are pretty cool, and they are great for storing away treasures in the attic. Well sweet thing, I am a bit like Mr. OTN. I too would go for the old trunk in the corner. 🙂 Love what you did with it! I too, have a hard time admitting hubby is right sometimes as well. lol! Glad to hear you are a strong woman too Jann. Although I already knew that about you. Hugs. You may be stubborn, but at least you’re a good listener, right?